New York — “In a special legislative session called with the intent of limiting Texans’ access to abortion care, Texas’ anti-choice Gov. Gregg Abott signed HB214, HB13, and HB215 into law — three bills that shame, pressure, and punish women who have decided to have an abortion in Texas. “The National Institute for Reproductive Health condemns these latest actions by Texas lawmakers to restrict access to abortion. The most recent bills signed by the governor include House Bill 214, which will block all insurance plans from covering abortion, forcing Texans to anticipate the need for an abortion and purchase a supplemental health insurance plan. This bill disproportionately impacts low-income Texans, people of color, and young people, making it difficult and in some cases impossible for women to access abortion. HB13 and HB215 require more state involvement in abortion providers’ practices and make it more complicated for younger women to access care. “HB 214 defies the national trend of cities and states demanding insurance coverage of abortion care. 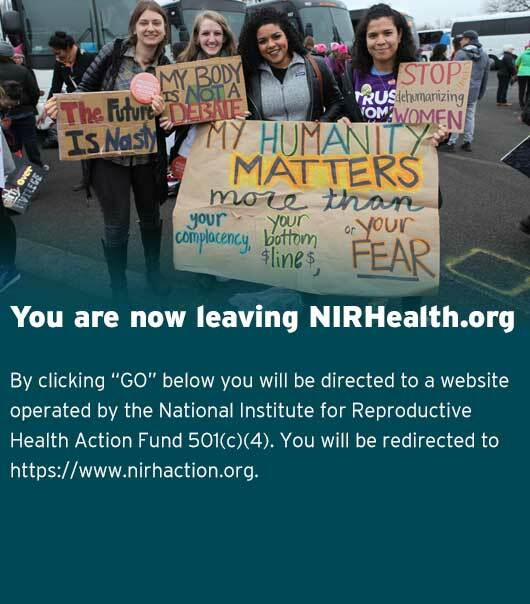 NIRH, All* Above All, and partners in 12 cities have worked to pass resolutions calling on Congress to lift restrictions on abortion coverage, and there’s growing momentum urging Congress to pass the EACH Woman Act, which would ensure abortion access for every woman who receives care or insurance through the federal government by prohibiting political interference in insurance coverage of abortion. “The last time the Texas legislature tried to push abortion out of reach for Texas women, advocates, outraged Texans, and eventually the U.S. Supreme Court stepped in to stop them. Now, the Texas legislature is back at it.